Planning for the Master in Management in September 2013? The world is getting smaller – thanks to IE! Is it you – the most beautiful mind? Influenced by its core values – innovation, diversity, entrepreneurship and social responsibility – IE Business School has created an online competition to determine the most brilliant minds of the world. 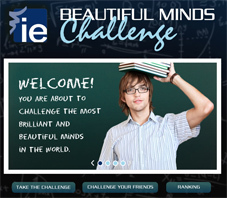 Test yourself, challenge others and compete to become the “one and only of the “IE Beautiful Minds Challenge” on Facebook.